Get back to nature in pretty Mecklenburg and Brandenburg. Abundant waters pepper the states of Mecklenburg and Brandenburg, lacing them with rivers, streams and literally thousands of small and large lakes. Castles perch on the shores of medieval villages, and resorts bustle on Lake Müritz, the largest lake confined within Germany’s borders. Mecklenburg-Brandenburg Boating Vacations usher you into paradise for lovers of Nature. Designated a UNESCO biosphere reserve in 1991, the Spreewald in Brandenburg is a natural for nature lovers! Trails weave through forests, wetlands and meadows, and wildlife thrives! Equally compelling is Müritz National Park in Mecklenburg. It features miles of cycling and trekking trails! The Lakeland district of Mecklenburg is a watery playground dotted with resorts and spas. Watersports vacations are hugely popular! rent a motorboat to go water skiing! Ride a jet ski! Glide on a windsurfer! In Brandenburg, you can enjoy watersports vacations at the resorts of Werder! Castle Mirow, Rheinsberg Castle and Sanssouci Castle Park are enchanting! In Neustrelitz, relax in the lush public gardens and admire the stunning Gothic-style Castle Church! And of course your history vacations will include the monuments, edifices and museums of Berlin and Potsdam! Spend time with the kids at Mecklenburg's Müritz Museum and aquarium. The gardens on the grounds contain a neat bee house where the family can learn about bee keeping! Take the kids on a nature walk in Brandenburg's beautiful Spreewald or to the vivarium in Mecklenburg's Jabel! 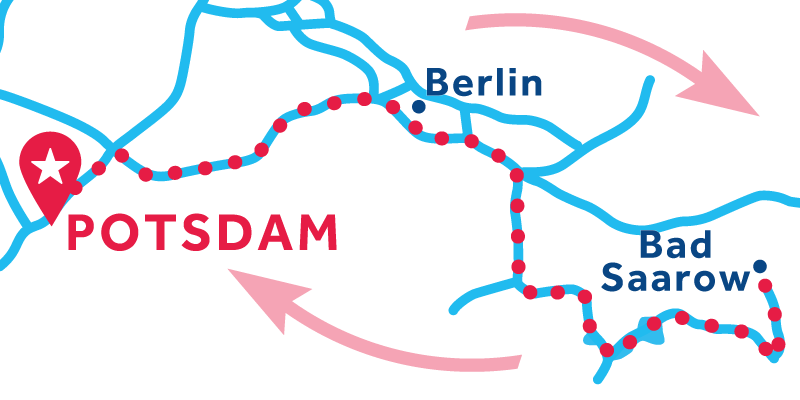 Please note: our Potsdam base will be closed until the 31st July as the lock at Zaaren is undergoing maintenance work. Our base in Marina Wolfsbruch is still open so return cruises from there will not be impacted. However, you will be unable to cruise from Marina Wolfsbruch into Berlin until this work is complete. Berlin is the largest city in the state Brandenburg, and it’s linked via canals to the Oder, Elbe and Rhine rivers as well as the North Sea. A glance at a Brandenburg map indicates that Berlin sits amongst vast tracts of nature reserves. Indeed, fully one third of the state is protected land sprinkled with more than 3,000 lakes, making it well suited for Boating Vacations! Potsdam, the capital of Brandenburg, once was Prussia’s seat of power. The plethora of Baroque palaces attests to that! Brandenburg’s neighbour, Mecklenburg, is similarly endowed with waterways. The region is often called the Land of a Thousand Lakes! Large and small lakes are everywhere, and dense forests line the hilly shores. Lake Müritz National Park, which hugs the eastern shore of Lake Müritz, boasts nearly 650 kilometres (400 miles) of trekking and cycling paths, and 130 lakes! Once upon a time, a huge frozen freshwater lake covered the entire state of Mecklenburg. The last Ice Age shaped the land, and as the climate warmed the lake thawed and split into smaller ones. Those then fragmented again. Lake Müritz is the biggest lake left with a present-day surface area of 112 square kilometers (43 square miles). Humans changed the water level of the lake a couple times, raising and lowering it through dams built to power mills in the 1700s. Please note that certain areas in Germany require a boating license for safety reasons and you will not be able to cruise these waterways without meeting the license requirements. Please refer to the map for full details. Foreign licenses can be reviewed for validation by German police, please send your license to our sales team so that we can verify they are adequate with the local authorities. Learn more here : https://www.howtogermany.com/pages/sailing.html. Please note that all cruises in Mecklenburg/Brandenburg require 3 hours of dedicated instruction. It is required to arrive at the base at 1pm on your departure day to get this instruction. If you already have a valid boating license, you will only be required to get an hour long instruction and you don’t need to be at the base at a certain time. Opening hours: Locks open 08:00-20:00 (8:00 p.m.) from May to October and 09:00-16:00 (4:00 p.m.) daily in April. Public holidays: Locks are open on public holidays. Welcome to Plau-Am-See, a peaceful and welcoming little village along the canal. Visit the charming ivy-covered City Hall while leisurely perusing downtown. For a change of scenery, take peaceful walk along the canal bank. Also called the City-Island, Malchow has many treasures for you to discover. Downtown, you will find a huge mill, and an old church from the 12th century with an organ museum inside. There's also a pretty flower garden if you're in the mood for a stroll. Jabel is a quiet and peaceful village a perfect place for relaxing and taking is easy. Stroll downtown and discover a beautiful, old brick church, and cycle around the canal bank to admire the beautiful scenery. Stop at Waren for a pleasant walk along the lake's bank, and enjoy it's wonderful landscapes. Downtown, you will find many quaint monuments, like the old timbered houses. You'll also want to see the old water tower and Saint-Mary's church. Welcome to Robel, a charming and peaceful town located along the large Muritz lake. Take a walk downtown between the colourful timbered houses, and enjoy one of their many fine restaurants. Mirow is a charming little town with timbered houses. Stop here to see the beautiful, Mirow castle located magnificently on its own island . The church, surrounded by lush countryside, is also a nice place to visit and relax. A beautiful harbor surrounded by forest, Marina-Wolfsbruch is a pretty little place where you will find many hotels and restaurants. If you would like to stretch your legs, there are also hiking paths on the outskirts. Along the bank, surrounded by a lush and green forest, stands the large Castle of Rheinberg. You may visit it, along with its gardens, and museum. Downtown, you will also enjoy seeing the Evangelical Church of Saint-Laurent, built in the thirteenth century. Neustrelitz is a large city with many beautiful sights to see, especially downtown. You will enjoy walking along a footpath and seeing the Zierke church which is surrounded by gorgeous green gardens, perfect for a walk. If you stay the night, you could possibly catch a show at the theater. Fustenberg is a city full of history. Here, you can visit a World War 2 memorial and learn about the events that took place in the city decades ago. The protestant church also makes for an interesting visit and there are also great paths for cycling. Once an old city of fishermen, Himmelpfort is now a famous tourist destination. Take a walk downtown and discover the vestiges of the old abbey. And, if you want to get a little exercise, there are plenty of beautiful cycle paths among the beautiful lakes. Lychen is located in the middle of a great natural park, a green and welcoming place perfect for relaxation. Come here and see the wonderful scenery and lakes during sunset, or go downtown and discover the beautiful sanatorium, or the Saint-Johannes church. Templin is a fortified city that you will enjoy visiting. Cross the Berlin gate and take a stroll through the large botanical gardens or wander along the old flowered walls of the city. Zehdenick is a gathering of several little villages. It is a pretty big town full of heritage that you may appreciate. Take time to take a stroll here and see the old fortified city church in Bergsdorf. Downtown, you may can tour the beautiful, newly-erected city church. Orianenburg, a beautiful city surrounded by forest, is riddled with history. You can visit the memorial and museum of Sachsenhausen, a former concentration camp. For fun, you can ride along the local cycling path, or have a rest aside the lake Lehnitz. Spandau is the fifth district of Berlin. Here, you will find a very dynamic and exciting area, filled with shops and restaurants. This place is particularly known for its former jail, which imprisoned nazis after World War 2. Berlin is a magnificient city to see. Tour the capital of Germany and experience its wonders, with many treasures and monuments to discover. Take time to visit the museum island and see the beautiful parliament along the canal banks...Bring your camera. Reminiscent of the splendour and glory of the Prussian state, Potsdam is packed with prestigious monuments. Take a walk here and discover the expansive Saint-Nicolas church, the colorful and impressive Sansoussi Palace, or the bustiling streets of the historic centre. Werder is a charming riverside town just to the west of Berlin. Its name comes from the old German word for a river island, and even today the town's old quarter is located on an island in the River Havel. Gottin is a peaceful town. Take a trip downtown and see an intringuing brick church built in the 14th century. Take a walk along the canal bank, and admire the beautiful manors surrounding it. Welcome to Brandenburg, a dynamic city. It is rare that such a large city would have so many lakes, rivers and canals. Here, you will enjoy visiting the Sainte-Catherine church , and the great cathedral. Plaue is one of the oldest and most populated places in Germany. Here, you'll find many wonderful monuments to visit, like the magnificient old castle Ehrenburg which is surrounded by nature, or the Sigismundikirche church. Seven natural reserves surround this city which is located in the biggest nature park in Brandenburg and in the biggest connected wetland within central western Europe. Cruise over the Templiner Lake to Caputh. In addition to the idyllic nature of this region, particularly popular with water sports enthusiasts and hikers, the area is famous for the charming Caputh Castle. Particualar gems include the tiled hall, the living rooms of Elector Dorothea and the landscaped garden designed by landscape architect Peter-Joseph Lenné. The village church, which dates back to the 19th century and was erected in the style of an Italian basilica, is situated diagonally opposite the castle. Island- and cathedral city located in green nature setting where the rivers Havel and Elbe meet. The cathedral is a monument and worth a visit. The water tourism project Blaues Band" offers lots of cultural events, sports and sightseeing. 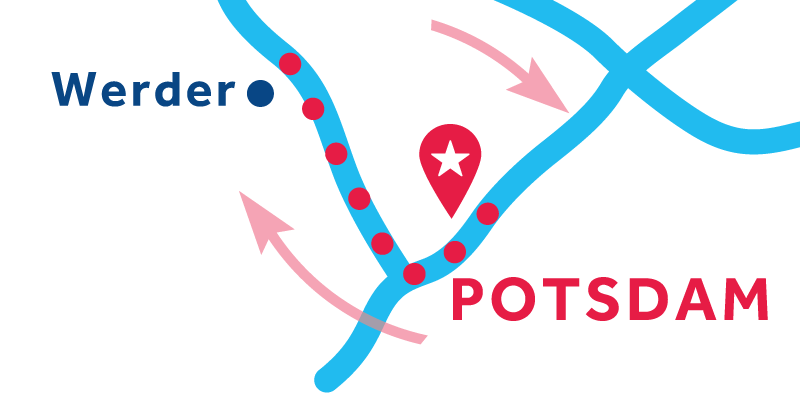 Please note: Our Potsdam base will be affected by maintenance work at the Zaaren locks. Only return cruises on our Cirrus boats will be operating until the 31st July from our Potsdam base. Our base in Marina Wolfsbruch will be operating as usual so return cruises from there will not be impacted. 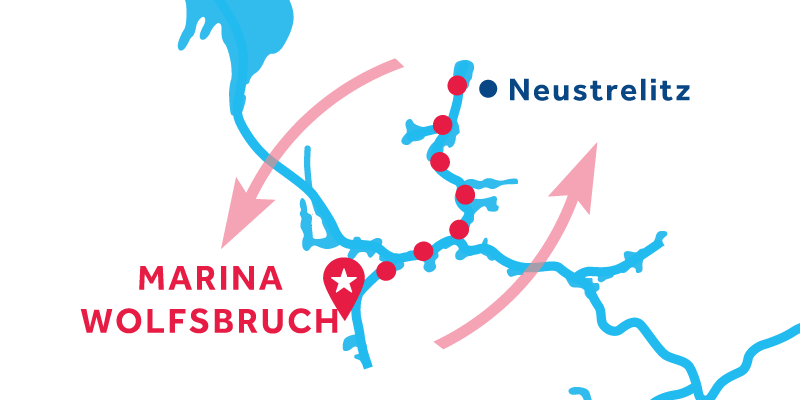 However, due to the maintenance work you will be unable to cruise from Marina Wolfsbruch into Berlin until this work is complete. The beauty of the Plauer See mesmerises as you travel toward the mediaeval town of Plau, famous for its impressive castle. You’ve discovered the charm of river cruises in Germany! You’re in the midst of a foray into a land of forests and mediaeval villages, of Baroque castles and cosy waterfront restaurants, of parks and lakeside resorts. Jabel: Jabel is a quiet and peaceful village a perfect place for relaxing and taking is easy. Stroll downtown and discover a beautiful, old brick church, and cycle around the canal bank to admire the beautiful scenery. Malchow: Also called the City-Island, Malchow has many treasures for you to discover. Downtown, you will find a huge mill, and an old church from the 12th century with an organ museum inside. There's also a pretty flower garden if you're in the mood for a stroll. Plau-am-See: Welcome to Plau-Am-See, a peaceful and welcoming little village along the canal. Visit the charming ivy-covered City Hall while leisurely perusing downtown. For a change of scenery, take peaceful walk along the canal bank. Waren: Stop at Waren for a pleasant walk along the lake's bank, and enjoy it's wonderful landscapes. Downtown, you will find many quaint monuments, like the old timbered houses. You'll also want to see the old water tower and Saint-Mary's church. It’s the land of 1,000 lakes, and the reason why is obvious as you follow the connecting waters to savour a delightful blend of culture, history, upscale shopping, fine dining and unparalleled natural beauty. The bustle of lively Waren stands in contrast to laid-back 13th-century Plau, but both represent distinct charms of Germany river cruises. Röbel: Welcome to Robel, a charming and peaceful town located along the large Muritz lake. Take a walk downtown between the colourful timbered houses, and enjoy one of their many fine restaurants. Mirow: Mirow is a charming little town with timbered houses. Stop here to see the beautiful, Mirow castle located magnificently on its own island . The church, surrounded by lush countryside, is also a nice place to visit and relax. Marina Wolfsbruch: A beautiful harbor surrounded by forest, Marina-Wolfsbruch is a pretty little place where you will find many hotels and restaurants. If you would like to stretch your legs, there are also hiking paths on the outskirts. Rheinsberg: Along the bank, surrounded by a lush and green forest, stands the large Castle of Rheinberg. You may visit it, along with its gardens, and museum. Downtown, you will also enjoy seeing the Evangelical Church of Saint-Laurent, built in the thirteenth century. You’ve crossed Lake Müritz and cruised to splendid Rheinsberg. You timed your arrival to coincide with a live evening concert on the grounds of the Baroque castle there, and you look forward to a stroll in the gardens beforehand. Germany river cruises offer a mix of pleasures, like some pampering at the resort amenities of Marina Wolfsbruch at the end of your travels! The waters of Lake Müritz stretch out before you, and grand castles jut from forested slopes. You think you’re in paradise as you guide the boat to the next resort, or as you nose into a new waterfront town with its very own Baroque palace. The big lakes are all part of a river cruise in Germany! The water sparkles off the bow and tall trees line the shores. The warm summer breeze carries the scent of wildflowers whilst you travel ever closer to a town that once hosted a grand palace destroyed in 1945. A river cruise in Germany brings you to this historic place with its Castle Church and Château Park, all harking back to a storied past! Neustrelitz: Neustrelitz is a large city with many beautiful sights to see, especially downtown. You will enjoy walking along a footpath and seeing the Zierke church which is surrounded by gorgeous green gardens, perfect for a walk. If you stay the night, you could possibly catch a show at the theater. Palaces and châteaux imbue Brandenburg and Mecklenburg with an ambiance of elegance. The incredible culture and beauty of Germany river cruises is obvious as you stroll in mediaeval market squares and browse in the shops in cities like Mirow and Rheinsberg. Pampering yourself is part of the fun, so you plan to thoroughly enjoy the watersports and resort amenities at Marina Wolfsbruch! Fürstenberg: Fustenberg is a city full of history. Here, you can visit a World War 2 memorial and learn about the events that took place in the city decades ago. The protestant church also makes for an interesting visit and there are also great paths for cycling. Himmelpfort: Once an old city of fishermen, Himmelpfort is now a famous tourist destination. Take a walk downtown and discover the vestiges of the old abbey. And, if you want to get a little exercise, there are plenty of beautiful cycle paths among the beautiful lakes. Lychen: Lychen is located in the middle of a great natural park, a green and welcoming place perfect for relaxation. Come here and see the wonderful scenery and lakes during sunset, or go downtown and discover the beautiful sanatorium, or the Saint-Johannes church. Templin: Templin is a fortified city that you will enjoy visiting. Cross the Berlin gate and take a stroll through the large botanical gardens or wander along the old flowered walls of the city. The Brandenburg and Mecklenburg regions are your vacation playgrounds on Germany river cruises you know you won’t forget! The myriad waterways wind through protected nature reserves. You come and play, shouting and laughing with friends whilst enjoying watersports on Lake Müritz and the resort amenities of Marina Wolfsbruch. Then you head off to explore mediaeval towns and castles! Plau: Welcome to Plau-Am-See, a peaceful and welcoming little village along the canal. Visit the charming ivy-covered City Hall while leisurely perusing downtown. For a change of scenery, take peaceful walk along the canal bank. The delights of Mecklenburg — watersports, fishing, cycling and trekking — give way to the urban pleasures of Brandenburg nightclubbing, fine dining and sightseeing in beautiful Berlin and Potsdam. The world is your oyster on Germany river cruises. You’ve planned well, choosing a cruise with a plethora of holiday experiences you and your companions will long remember! Please note: A licence is required for this cruise. Ask us for more details on how to obtain it. Zehdenick: Zehdenick is a gathering of several little villages. It is a pretty big town full of heritage that you may appreciate. Take time to take a stroll here and see the old fortified city church in Bergsdorf. Downtown, you may can tour the beautiful, newly-erected city church. Orianenburg: Orianenburg, a beautiful city surrounded by forest, is riddled with history. You can visit the memorial and museum of Sachsenhausen, a former concentration camp. For fun, you can ride along the local cycling path, or have a rest aside the lake Lehnitz. Spandau: Spandau is the fifth district of Berlin. Here, you will find a very dynamic and exciting area, filled with shops and restaurants. This place is particularly known for its former jail, which imprisoned nazis after World War 2. Berlin: Berlin is a magnificient city to see. Tour the capital of Germany and experience its wonders, with many treasures and monuments to discover. Take time to visit the museum island and see the beautiful parliament along the canal banks...Bring your camera. Potsdam: Reminiscent of the splendour and glory of the Prussian state, Potsdam is packed with prestigious monuments. Take a walk here and discover the expansive Saint-Nicolas church, the colorful and impressive Sansoussi Palace, or the bustiling streets of the historic centre. 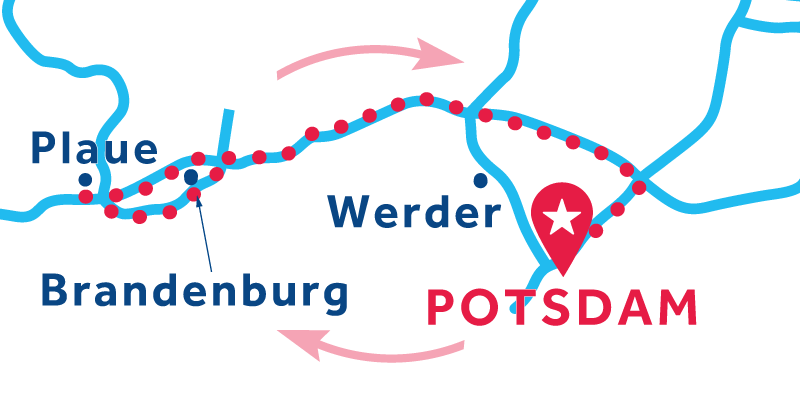 Set in a landscape of lakes and rivers a return cruise from our base in Potsdam to Werder is the perfect way to explore the natural beauty of this part of the world. When you arrive in Werder you'll find a picturesque and charming town to while away the day. The area is also known for its wine-production, with wine being produced here since the 1300s! Caputh: Cruise over the Templiner Lake to Caputh. In addition to the idyllic nature of this region, particularly popular with water sports enthusiasts and hikers, the area is famous for the charming Caputh Castle. Particualar gems include the tiled hall, the living rooms of Elector Dorothea and the landscaped garden designed by landscape architect Peter-Joseph Lenné. The village church, which dates back to the 19th century and was erected in the style of an Italian basilica, is situated diagonally opposite the castle. Werder: Werder is a charming riverside town just to the west of Berlin. Its name comes from the old German word for a river island, and even today the town's old quarter is located on an island in the River Havel. The Spreewald Nature Reserve covers approximately 480 square miles and has more than 300 canals lacing low marshes that are home to myriad species of wildlife. This is your wondrous playground for a Germany river cruise! It’s not so far from the discos, upscale restaurants, museums and historic sites in the cities, but you feel like it’s a whole world away! Bad Saarrow: Since the beginning of the 20th century, this village, with a source of supposedly healing water, has developed into a small spa town. Enjoy a salt water and mud bath at the spa resort on Scharmützel Lake. You can also enjoy a swim in the lake itself, which has a large number of bathing areas and incredible water quality. Golf lovers should certainly play a round on the Bad Saarow golf course. Horse riding, tennis, hiking and water sports all are available in Bad Saarow. Nearly a third of Brandenburg is designated nature reserves. In fact, 15 protected areas teem with wildlife in marshes and forests, and the region is dotted with more than 3,000 lakes studded with mediaeval castles and towns! You’ve chosen an ideal locale for Brandenburg river cruises in Germany! The former centre of the Duchy of Prussia is endowed with exquisite country charm. Göttin: Gottin is a peaceful town. Take a trip downtown and see an intringuing brick church built in the 14th century. Take a walk along the canal bank, and admire the beautiful manors surrounding it. Brandenburg: Welcome to Brandenburg, a dynamic city. It is rare that such a large city would have so many lakes, rivers and canals. Here, you will enjoy visiting the Sainte-Catherine church , and the great cathedral. Plaue: Plaue is one of the oldest and most populated places in Germany. Here, you'll find many wonderful monuments to visit, like the magnificient old castle Ehrenburg which is surrounded by nature, or the Sigismundikirche church. The great Lake Werbellinsee comes from the meltings of the majestic moutains around here for millenia. Cruise along the pretty river Havel and discover a part of Germany's history and patrimony, seeing monuments like famous Joachimsthal village and its hunting lodge made by King Frederick William IV of Prussia ; or beautiful charming villages such as Echhorst. In this preserved area, you will for sure enjoy the quietness of the places - perfect moments for enjoying the sunset over the lake, eating one of the regional dish : the Marane! The river Havel is stringing together lakes whilst passing through the states of Mecklenburg, Berlin, Brandenburg and Saxony-Anhalt. The hilly countryside is streaked by rivers, lakes, marshes, wetlands and fields. No matter if you are into history, hiking, watersports or if you just want to relax – this is the place to go! Rathenow: Seven natural reserves surround this city which is located in the biggest nature park in Brandenburg and in the biggest connected wetland within central western Europe. Havelberg: Island- and cathedral city located in green nature setting where the rivers Havel and Elbe meet. The cathedral is a monument and worth a visit. The water tourism project Blaues Band" offers lots of cultural events, sports and sightseeing. This short return cruise begins at our base in the historic city of Potsdam, perched idyllically on a meander of the Havel River. In Potsdam you can explore the splendid gardens and palaces which have made Potsdam a Unesco World Heritage site, before cruising on to Berlin - Germany's dazzling capital city. Dive into the richly textured history and vibrant modern culture to see for yourself why Berlin is considered one of Europe's coolest cities. Exerience all of this and more from the comfort of your very own river cruiser on this spectacular short break. the boat was in perfect condition; the office staff polite and very helpful; the fifth star is lacking because the familiarizing with the boat is too short - especially the driving. The instructor did the driving by himself, and I just watched. hands on by the renter would be more productive! A very quiet, relaxing and fun vacation! Все было отлично, однако у нас возникли сложности с английским с некоторыми сотрудниками. Инструкторы не подвели, было все грамотно и оперативно Все супер, как и всегда!! Were very helpful! Nice boat!Kids were happy! We enjoyed our boating experience in Germany with Le Boat. Would make use of Le Boat again (maybe in Canada next year!). BUT we have a list of recommendations/suggestions for the specific base in Germany though! Would also help that the people in South Africa recommend certain things to their clients. Do not know if we must list it here??? Training/instruction must be done by a person that can really speak English and explain properly what one needs to know. 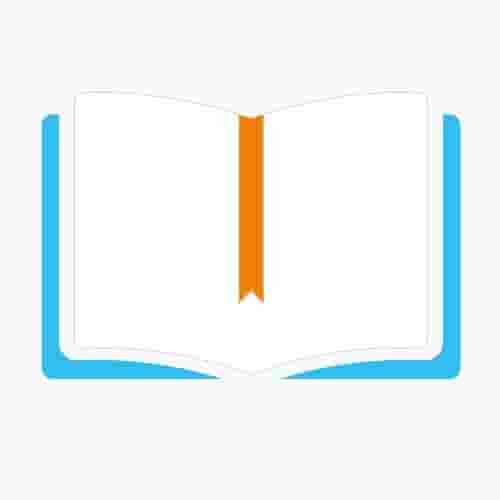 Some of the information in the English training manual was not very clear and well explained at all. We did not choose the option to pay "Le Boat" to clean the boat, so we did it ourselves thinking we had to give back the boat in the same condition we received it. When they inspected the boat we were asked why on earth we did it all so perfectly - they clean it anyway after each rental! We really wanted a stand up board - we were told that there were none available, all rented out to people before us! But it was booked and prepaid, if we knew we would have rented it somewhere else beforehand! Suggestions by SA booking office - please suggest to your customers to take along own "toys" / like stand up board / Tubes to trail behind boats etc. Also some insect stuff to spray on boat & on persons, encountered a lot of insects. This questionnaire not very clear? What purchase do you mean? The renting of the boat for 3 nights? This specific route? We have some suggestions to make! One would rather do a circle route than go back on the same route! Would be much nicer to drop off the boat at another point! 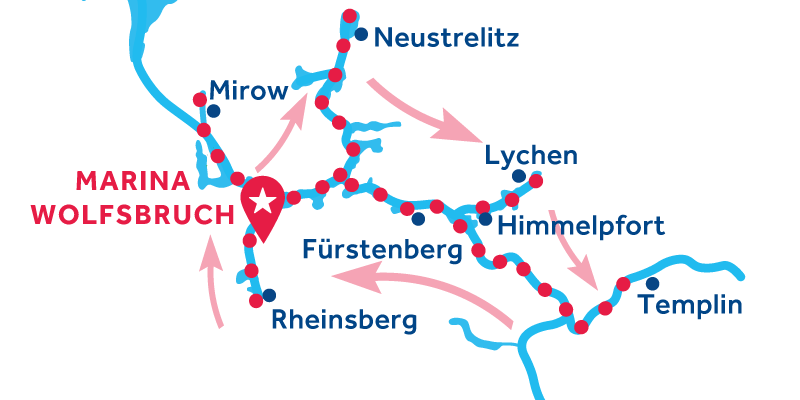 The info given by Le Boat Germany for our outings/stops along the way were very little and not enough to make it clear where to find what on our way/route. The little that they eventually gave us we had to ask for! And it was no more than what was on the website was given at first! Suggestions to South African booking office - please suggest to your customers to take along own "toys" / like stand up board / Tubes to trail behind boats etc. Also some insect stuff to spray on boat & on persons, encountered a lot of insects. The quality of the boat was impressive. The routes on the maps were also well looked after and the route and villages were terribly beautiful. I'll say you can give a little better training. We received a 15 minute training after our "guy" left without told us where he is going. :( Can't upload the photos :( I don't understand the purchases? The holiday was good value. Nice boat, nice area, service pretty good. Good boat, lovely area, great weather. Jabel is in the heart of ‘Lake Country’ with Lake Muritz just a couple of hours away. Simply enjoy watersports, outdoor adventures in the crystal-clear waters and the spectacular scenery Mecklenburg has to offer. 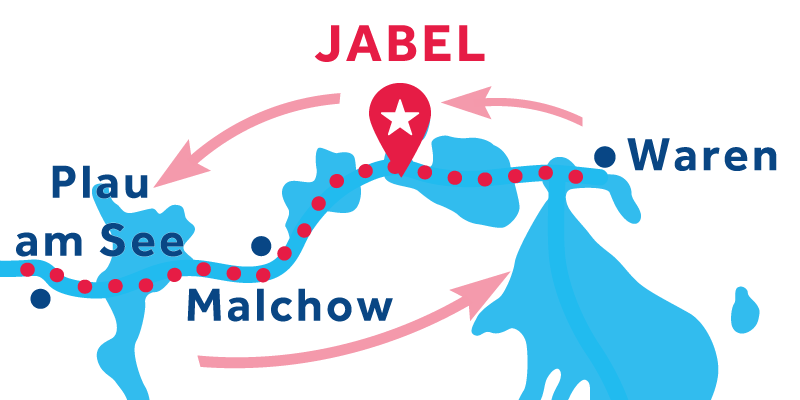 Jabel is a good place to start (and/or finish) your vacation afloat. Cruising from Jabel is license free. Marina Wolfsbruch, our largest base in Germany, offers easy, license-free access to the many wide open lakes and grand waterside palaces of the Mecklenburg region. Iconic Rheinsburg Castle is just over an hour south, Lake Muritz is 5hrs north and a fascinating network of lakes and villages lay eastwards. Marina Wolfsbruch is the idea central location for those wanting to do and see lots in this ‘playground of nature’. Potsdam is in the Brandenburg region. While the stretch of waterway on which the base is located is license free (you can enjoy a short break as far as Werder) to travel any further you will need a license. The bright lights and cosmopolitan vibe of central Berlin is just 5hrs from Potsdam, with the pretty nature reserve of Spreewald beyond. Potsdam itself is the capital of this region and worth exploring, especially to see the Rococo splendour of Sanssouci Palace.